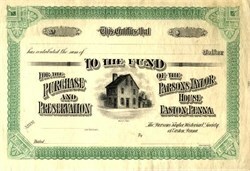 Beautifully engraved RARE Specimen certificate for the Purchase and preservation of the Parsons Taylor House printed around 1900. This historic document was has an ornate border around it with a vignette of Parsons Taylor House built in 1757. This item is over 109 years old. This is the first time we have seen this certificate, possibly unique. 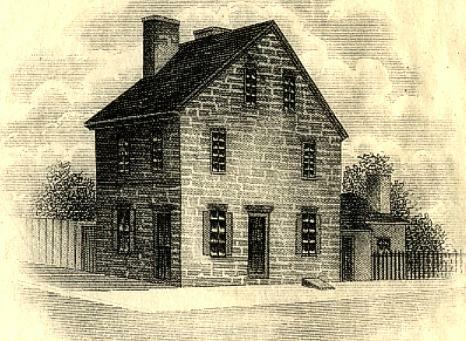 This house, built by William Parsons in 1757, was leased by George Taylor during the last year of his life and was the site of his death in February 1781. His health failing and his iron business declining, he had moved there the previous April from Greenwich Township, N.J. The residence, a small, two-story Georgian structure constructed of fieldstone, has a steep gable roof and a pent roof extending along the front at the second-floor level. A single chimney is located in the north sidewall. The front door is surmounted by a rectangular transom; the center door, in the south side, is sheltered by a hood. A frame attachment to the house, probably existing in 1780, no longer stands. A single large room containing stairs and a fireplace on the north wall make up the first floor. The walls are plastered, and the joists are supported by heavy, exposed beams. Bedrooms occupy the second floor and attic. Restored about 1906, the structure is in fine condition and is owned by the George Taylor Chapter, Daughters of the American Revolution, which uses it as a meetingplace. The Parsons Taylor House is open regularly for tours in seasonable weather, usually 2 to 3 days per week, They also open for some special local events, such as Easton's annual Heritage Day, which commemorates the reading of the Declaration of Independence in Easton on July 8, 1776.